[Update 16-Jan-2012: This topic is on Council agenda Jan 17. See here. ] 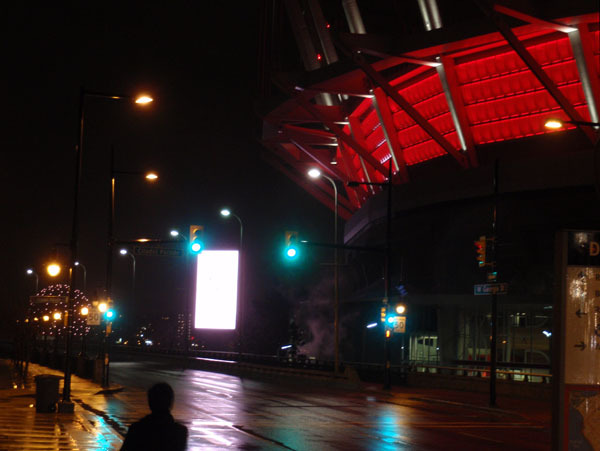 The giant electronic billboard at BC Place continues to aggravate neighbouring residents in 2012. 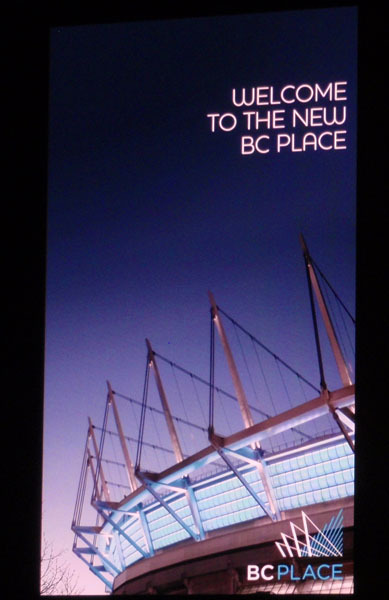 This billboard is in clear violation of the City of Vancouver’s sign bylaw (section 10.3). During the stadium renovation, B.C. Pavilion Corporation (PavCo) installed this sign on Terry Fox Plaza at Beatty Street and Robson. 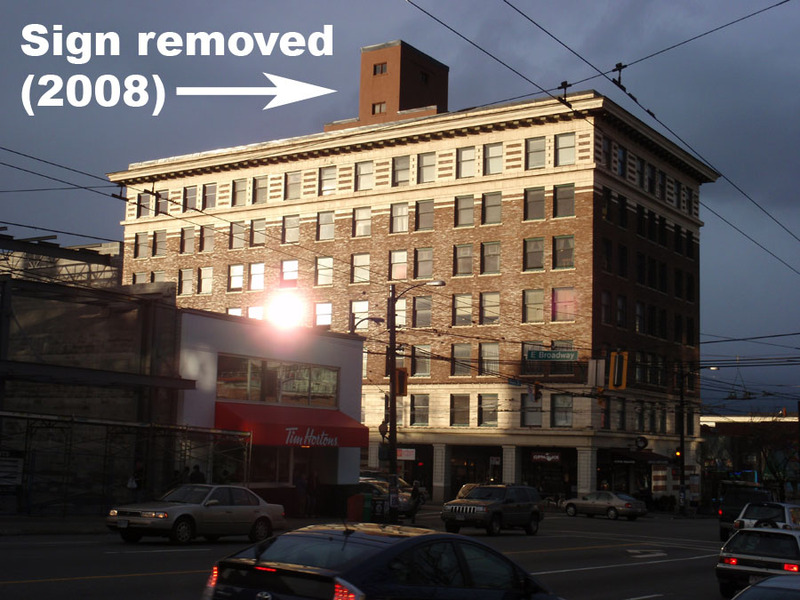 The giant billboard on the Lee Building at Main and Broadway was removed by a Court Order as reported by the CBC in 2007 (Top court decision bad sign for Vancouver billboard owners). At that time the Supreme Court refused to hear an appeal to overturn earlier decisions by the BC Supreme Court and the BC Court of Appeals that ordered the sign to be removed and dismantled. The defendants were also ordered to pay for the city’s legal fees. This billboard was removed from the Lee Building in compliance with the court order (pictured). 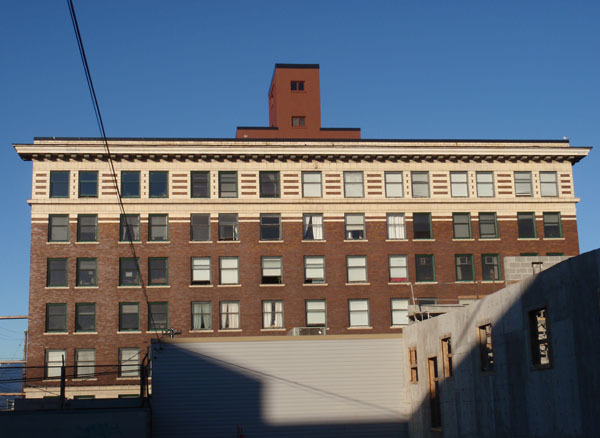 At the time, the City of Vancouver had assembled an entire legal team to fight the billboard in Mount Pleasant; the city has experience and a precedent in fighting illegal billboards. PavCo is not entirely exempt from the City of Vancouver’s bylaws, as the recently enacted Edgewater Casino relocation required the approval of City Hall. In fact, the City of Vancouver could have used their leverage with PavCo and choose not to enact this bylaw on November 29th, 2011 until the legal challenge to the relocation of the Casino was heard (see VancouverNotVegas.ca). Neighbouring residents have made further information available on the blog Take the Giant Screen Down Now and via Twitter @StopBillboard. 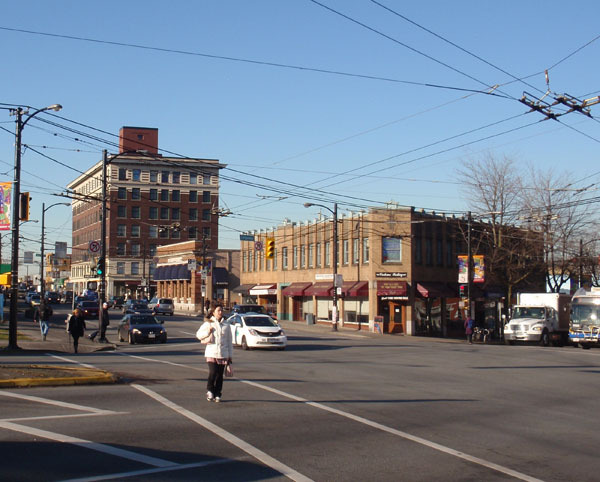 The City of Vancouver can play hardball with PavCo on several fronts. 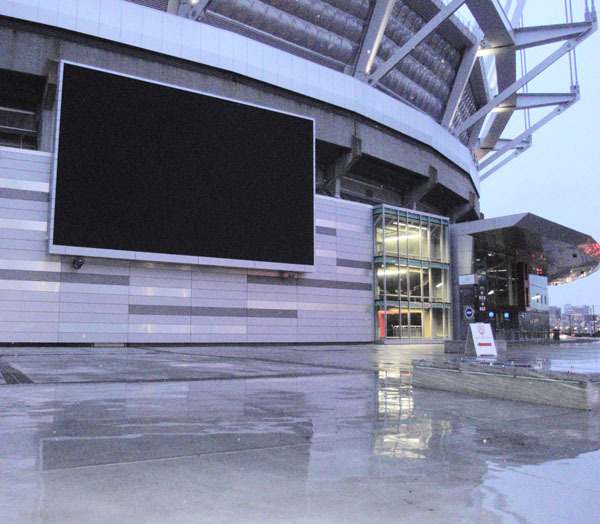 There are a couple of other giant illuminated screens around BC Place that also have significant impacts, such as the pictured screen along W.Georgia, and a screen on the south side seen from the opposite side of False Creek. The links to the archives have been now updated. Thanks for pointing this out. The photo can also be found by going to the archives website and by searching for ‘Lee Building photograph’. The item is CVA 772-961 Kingsway and Broadway [looking] west. – [between 1980 and 1997]. The CBC article also has a photograph of a billboard on the Lee Building.